Is the CW making a Hunger Games TV show? A new batch of TV pilots have leaked, and it looks like the studio is relentlessly cribbing what's hot. What do we have to look forward to? Another Grimm and The Hunger Games-lite. If there aren't more than two supernatural cop shows on the air at the same time, Atlas will let the Earth tumble into the abyss. TV Line is reporting that hidden inside the four new pilots from ABC is the series titled Gotham. Created by Michael Green (Heroes), this show "centers on a female cop who discovers that a magical world exists within New York City." Based on the forthcoming series of books by Kiera Cass, The Selection is an epic romance set 300 years in the future which centers on a poor young woman who is chosen by lottery to participate in a competition to become the next queen of a war-torn nation at a crossroads. based on the Israeli format Danny Hollywood. In this romantic time-travel musical, a documentary filmmaker travels back in time to the 1990s where she meets and falls in love with the rock-star subject of her film. When she unexpectedly returns to present day, she must find her way back to the past to reunite with her love and prevent his untimely death. A musical! Will the promise that was Cop Rock finally be realized? 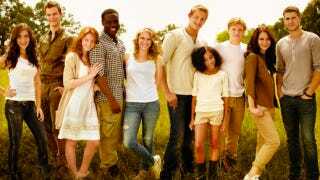 Image via Vanity Fair Hunger Games photo shoot.